Burwood Girls High School is in the inner suburbs of Sydney, Australia. Burwood Girls is a government school with 1100 students aged 12-17 years. The Ensemble Program involves about 250 girls in Wind, String, Brass and Vocal Ensembles, an Orchestra, Stage Band, Rock and Folk groups. The 55 students who made this trip are thrilled to be the first ever Australian school to take part in the Honolulu Festival Grand Parade. 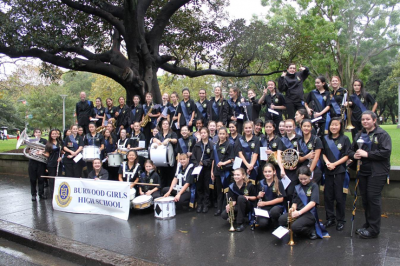 The director of the Burwood Girls High School Band is Dr. Genevieve Campbell.